PCOS Conceived by Injections without Laparoscopy or IVF. The first line of treatment in PCOS (Polycystic Ovary Syndrome) is weight control. Medicines like Metformin or Inositol can be added, if needed. The second step is OVULATION INDUCTION (OI)- giving MEDICINES, ORALLY (Clomiphene or Letrozole) so that the eggs grow and get released ("Ovulation"). But while taking medicines, its important to see if the medicines are able to induce ovulation, by TVS Follicular Study. Of course, the sperms and the tubes must be alright before planning OI. The third step has two options- Injections and Laparoscopy. But when to go to the third step? If oral medicines have been able to induce ovulation but failed to give pregnancy even after trying for 4-6 cycles. Any oral medicines SHOULD NOT be taken for more than 6 months at a stretch (Because pregnancy should happen within 6 months of taking the medicines, if everything is OK). So, what are included in the third step? It includes LOD and Injections. By Laparoscopy ("Microsurgery", putting camera inside the abdomen by key-hole), some of the follicles ("Cysts") are burned using electric current. Any other possible diseases and causes of infertility can be detected (diseases of the tubes, endometriosis etc). If the woman is having pain/ endometriosis/ cyst etc, these can be treated at the same time. After laparoscopy, the chance of spontaneous conception increases (without need of frequent visits to the doctors). If LOD is done in over-enthusiastic manner (many cysts are burned), it will damage the ovaries and the woman can land up in PREMATURE MENOPAUSE. There is risk of anaesthesia and surgery. The "Adhesion" (abnormal attachment between the organs) caused by Laparoscopy may further increase the risk of INFERTILITY. There was no response (Ovulation) with oral medicines. All these 3 factors MUST be present before LOD. Otherwise, LOD will do more harm than benefits. These are basically hormones ("Gonadotrophins") which are used to induce the Ovulation (a form of Ovulation Induction). Usually oral medicines are added to reduce the need and the cost of the injections. With Injections, it is MANDATORY to perform TVS Follicular Study regularly to see if Ovulation is happening and whether there are any complications like OHSS. Injections can be taken for maximum 3-4 months. Increases the chance of spontaneous pregnancy more than that by the oral medicines. Along with injections, IUI (Intrauterine Insemination) can also be done to improve the chance of success. Can predict the response of the woman, if she requires IVF in future (if injections fail). Need to visit frequently for TVS. The risk of OHSS (Ovarian Hyperstimulation Syndrome)- a condition where the ovaries respond in excessive manner, leading to development of many follicles and accumulation of fluid inside the abdomen and rarely inside the chest. Proper monitoring can reduce the risk. The risk of multiple pregnancy (twin, triplet) is slightly higher than oral medicines. if the woman wants to take some time before planning IVF. The fourth step of treatment in PCOS is IVF. Compared to the other causes of Infertility, the results of IVF are better in PCOS. But the risks of OHSS and multiple pregnancy are there. Use of correct dose of medicines and frozen Embryo Transfer decrease these risk. This couple came to us with infertility of four years. The woman is having PCOS. She tried oral medicines for 12-14 cycles but no pregnancy happened. They were advised to have Laparoscopy. they came to us to seek second opinion. We asked them, "what you are planning?". The reply was "We are frustrated. We will go for IVF in April (after financial year ending). We do not want Laparoscopy. Can we try any other treatment while preparing (mentally and financially) for IVF?" After explanation of benefits and risks, they wanted to try injections for 2-3 months. We gave them injections with oral medicines and performed TVS Follicular Study and found good response. They agreed to try it for another 2 cycles before IVF. 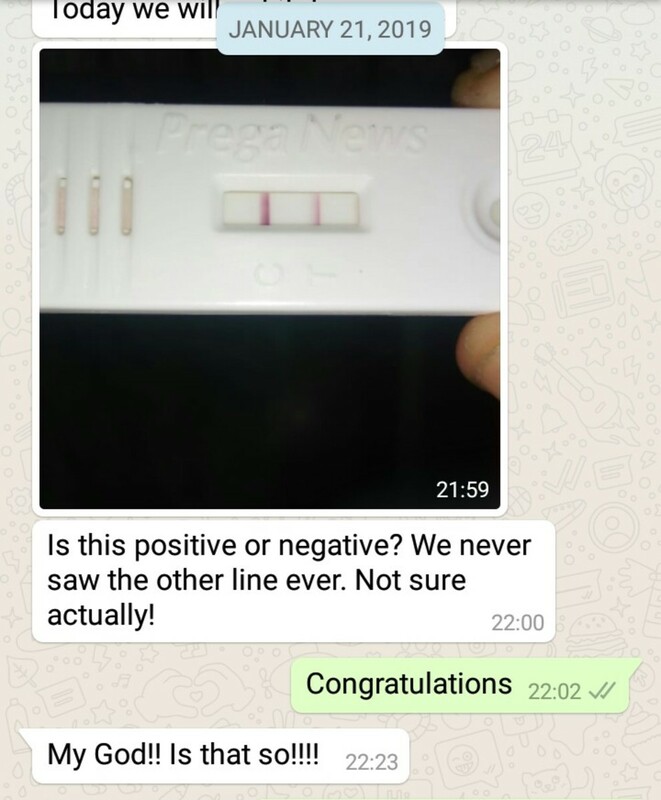 They tested urine for pregnancy but could not believe what they were seeing. (Uploaded with their kind permission). We are keeping our fingers crossed.